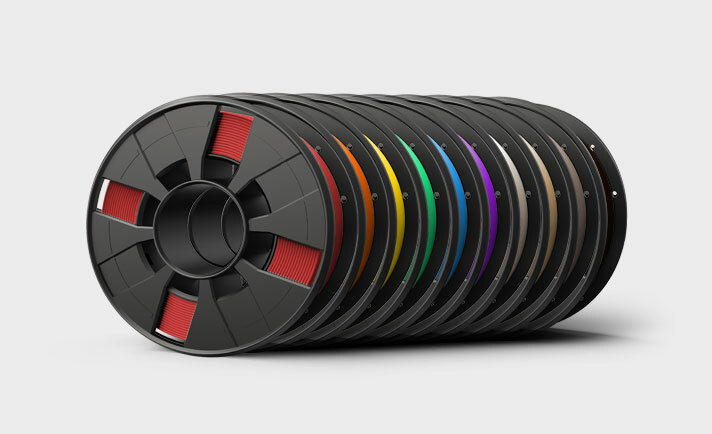 Get ten Small Spools of MakerBot PLA Filament for the price of nine! This pack of filament includes one small spool in each of the following: True colors: Red, Orange, Yellow, Green, Blue, Purple, White, Warm Gray, Cool Gray, and Black. MakerBot PLA Filament is the best and most consistent filament optimized for use with the Replicator Mini+, Replicator+, and MakerBot's 5th Generation Line of 3D Printers. This size spool is for use with the Replicator+, Replicator Mini+, all Fifth Generation MakerBot Replicator 3D Printers, and the MakerBot Replicator 2 Desktop 3D Printer.